Following a number of questions regarding the location of controls 203 and 204, it was agreed that the control was not in the place marked on the map. It was decided to shorten courses 1, 2, 4 and 7 at the control prior to the error. We'd also like to make it clear that the tripod was added to the map after the survey was completed. We apologise for the error and hope that the action we have taken was appropriate in the circumstances. Fast open fell and detailed limestone woodland. Grid Ref SD 393805 Postcode LA11 6HL. Hampsfield Hall, leave A590 at south end of High Newton bypass and follow signs for Cartmel, after 1 mile turn left at the cross roads, after ½ mile turn left into car park. Adjacent to car parking, toilets, traders and EOD registration. All starts are together, 1.5km and 100m climb from assembly, (30 mins). There are two finishes, one 600m from assembly and one 800m from assembly, return along the route to the start. Updated and extended in August 2013. Courses 1 to 14 are at a scale of 1:10,000. Courses 15 to 17 at a scale of 1:7,500. All maps are A4 size. Standard symbols, plain grey screen depicts limestone pavement; can be very slow. There is also one man made control, a tripod, shown as a black cross. The terrain is highly varied with fast, sheep cropped open fell as well as low visibility woodland on steep slopes with fine rock and contour detail. The open fell area is divided by a number of un-crossable dry stone walls which must only be crossed at marked crossing points. (Future permissions depend on this). Temporary stiles are marked with red/white tape. Permanent stiles and gates will not be marked with tape. Please close all gates behind you. 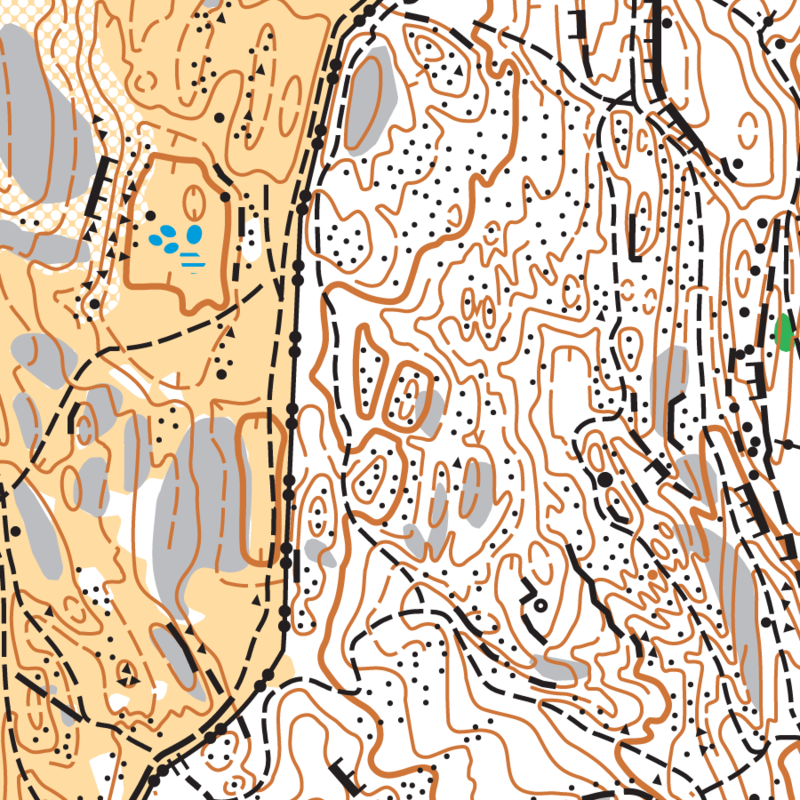 The eastern area is complex contour woodland which is very runnable but has limestone rock underfoot. All courses will encounter limestone pavements. These are very slippery if wet or moss covered; take care. Examples of these features can be seen in the prestart area, parents are recommended to show these to competing children. The woodland is heavily used by the general public and some small paths are not mapped. Much of the area is very technical. Following the mild winter, vegetation is thicker but no more extensive than usual. Most courses will encounter some undergrowth and bracken in places. Limestone walls are fragile; the uncrossable walls are marked with the ‘double dot’ high stone wall symbol. Where a ‘leg’ has only one feasible crossing point, the line between controls has been bent. Where there is a choice of feasible crossing points, the line is straight and broken at the un-crossable wall. Crossing points MUST be used! The overall results for all classes are available here. General competitor information relevant to all days. Provisional course details including Start colour, distances and climb. Distances from parking to Assembly and from Assembly to Starts can be found on the individual day pages.